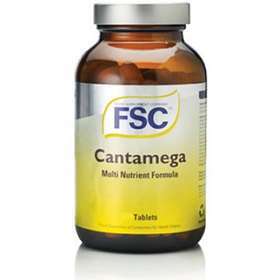 FSC Cantamega Multi Nutrient Formula 180 Tablets A comprehensive formula of primary vitamins and minerals the body needs to gain and maintain good health. Vitamin A: being one of the main antioxidant nutrients in our diet. Vitamin D: essential for healthy bones, as well as teeth. Vitamin E: is recommended for those going through the menopause and also helps maintain a healthy reproductive system and healthy skin. Additional vitamins combined multi nutrients i.e. Magnesium which helps to stimulate the nerves and muscles, and importantly the heart helping it to function properly. A general health supplement used as a daily essential for energy production and balance.